KATHMANDU: Stocks fluctuated around the unchanged line for most of the initial trading session on Tuesday. 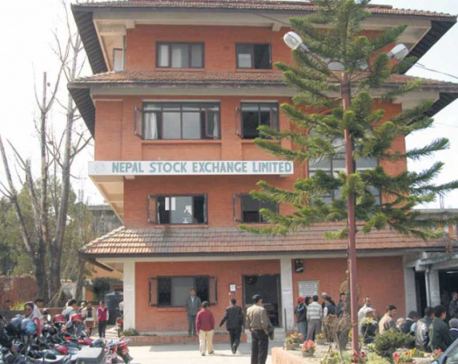 Consequently, the Nepal Stock Exchange (Nepse) Index traded flat till mid-session. However, stocks came under slight pressure in the latter trading hours as the index dropped by a modest 2.70 points to end the day at 1,241.84 points. With the day’s losses, Nepse has stretched its losses for the second straight day. However, with modest movements and sub-par market activity in the recent sessions, the selling momentum seems fairly faint. Hence, a state of indecision can be seen among investors. 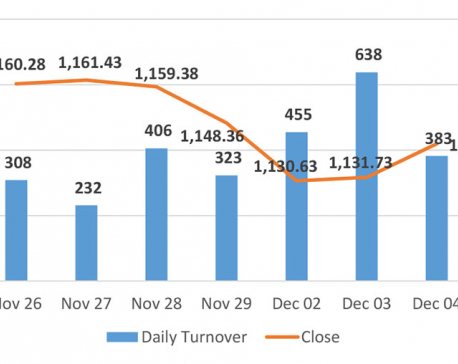 The bourse posted a turnover of over Rs 198 million in the day. Most of the sectoral indices maintained negative bias in the day’s trading. Only Manufacturing & Processing, Finance and Banking sub-groups ended the day in green while Hotels sub-index closed flat. On the losing front, Non-Life Insurance stocks suffered on Tuesday with the sub-index dropping 1.24 percent. Sub-indices of ‘Others’, Microfinance and Life Insurance stocks also ended the day fairly lower. Development Bank and Hydropower sub-indices also slid slightly in the day. In terms of market activity, Prabhu Bank Ltd posted the highest turnover of over Rs 33 million in the day. Second on the list of actives, NIC Asia Bank Ltd logged in a total transaction of Rs 17 million. Subsequently, more than Rs 10 million worth of shares of Kumari Bank Ltd were traded on Tuesday. Mega Bank Ltd, NMB Bank Ltd and Nadep Laghubitta Bittiya Sanstha Ltd were among other active stocks. Among the advances, shares of United Finance Ltd shot up by almost 10 percent in response to the company’s announcement of issuing 2.1 million units promoter share to Muthoot Finance Ltd of India. The respective issue is priced at Rs 190 per share and is subject to approval from the company’s annual general meeting (AGM) on November 16. Stocks of Arun Kabeli Power Ltd also rallied over 5 percent on the day while shares of Global IME Laghubitta Bittiya Sanstha Ltd closed 3.72 percent higher. Other gaining securities include Samina Equity Fund, Purnima Bikas Bank Ltd and Nepal Insurance Company Ltd. 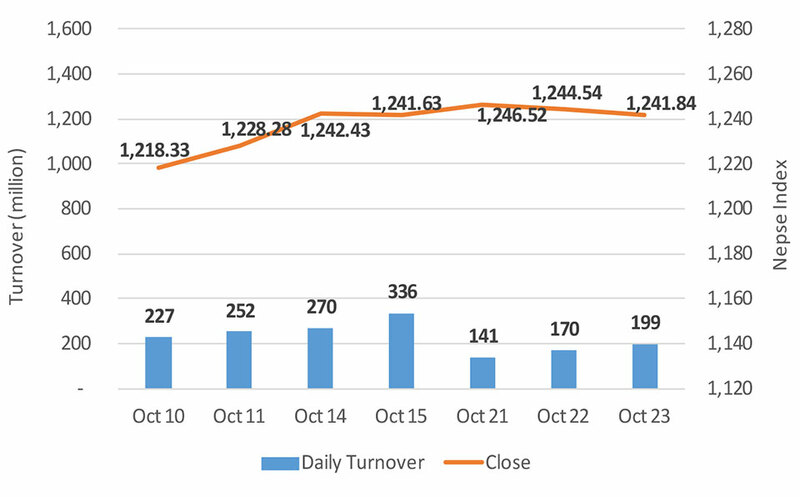 In contrary, Samata Microfinance Bittiya Sanstha Ltd’s scrips were the biggest drag in the day registering a drop of over 4 percent. Likewise, shares of Kalika Laghubitta Bittiya Sanstha Ltd and Prudential Insurance Company Ltd skidded over 3 percent. Shares of First Microfinance Laghubitta Bittiya Sanstha Ltd also tumbled 3 percent after the micro sector lender reported a year-on-year decline in its net profit. As per its first quarterly financials of the fiscal year 18/19, the company’s net profit fell by 4.4 percent to Rs. 23 million mainly attributed to the decline in its net interest income. ARKS technical analysis indicates the market forming a small bearish candle for a second straight day. However, range bound trading has prevailed in the past few sessions. Technical indicators also suggest a neutral momentum in the present context coupled with low volume trading sessions. Hence, cautious trading should be done in the forthcoming days. The support for the market rests at 1,210 points while the resistance lies at 1,280 points level.